It was the year 1519 and Hernán Cortés, with some 600 Spaniards, 16 or so horses and 11 boats, had landed on a vast inland plateau called, Mexico. The Span­ish con­quis­ta­dor and his men were about to embark on a con­quest of an empire that hoarded some of the world’s great­est trea­sure. Gold, sil­ver and pre­cious Aztec jew­els were just some of what this trea­sure had to offer any­one who suc­ceeded in their quest to obtain it. But, with only 600 men — none of whom had encum­bered them­selves with pro­tec­tive armour – con­quer­ing an empire so exten­sive in its ter­ri­to­ries could only be under­taken by a man with a death wish. This dar­ing under­tak­ing was made even more insur­mount­able by the fact that for more than 600 years, con­querors with far more resources at their dis­posal who attempted to col­o­nize the Yucatan Penin­sula, never suc­ceeded. Hernán Cortés was well-aware of this fact. And it was for this rea­son, that he took a dif­fer­ent approach when he landed on the land of the Mayans. Instead of charg­ing through cities and forc­ing his men into imme­di­ate bat­tle, Hernán Cortés stayed on the beach and awoke the souls of his men with melo­di­ous cadences – in the form of embla­zoned speeches. His speeches were inge­niously designed to urge on the spirit of adven­ture and invoke the thirst of life­times of for­tune amongst his troops. His ora­tions bore fruit, for what was sup­pos­edly a mil­i­tary exploit, now bore the appear­ance of extrav­a­gant romance in the imag­i­na­tions of Cortés’ troops. It was a deci­sion that should have back­fired. For if Cortés and his men were on the brink of defeat, there wasn’t an exit strat­egy in place to save their lives. Remark­ably though, the com­mand to burn the boats had an oppo­site effect on his men because now, they were left with only 2 choices — die, or ensure vic­tory. And fight they did. We know today how Cortés’ deci­sion to burn his boats panned out. Hernán Cortés became the first man in 600 years to suc­cess­fully con­quer Mexico. Like all of us, you live in a world where we’re taught that certain aspects of life are “the way they are” and that “this is just how we do it”. Everywhere we go, we see people doing the same things – working, stressing, consuming… and then repeating this cycle over and over again. We work long hours to pay for a life that we barely visit in order to consume in ways that imprison us in a mountain of stuff. We eat food that is proven to cause disease, shortening our lives and greatly reducing the effectiveness and enjoyment of our prime years. This mainstream path begins when we are young. We go to school and “learn”, mostly, how to regurgitate facts and figures without being taught to think. Without thinking, then, we schlep off to college in order to get a degree, and then hopefully land a precious “job”. In this job, we swap our time for money, often spending years paying off our college debt, accumulating a mortgage and many other things that provide short-term relief to the gnawing sense of emptiness and meaninglessness growing inside. Along the way, we consume the standard western diet, usually adding weight to our bodies and plaque to our arteries. Without noticing it, our health erodes over time, zapping us of the vibrance which is our birthright, and pointing us down a disease-ridden path certain to shorten our life span, often considerably. We also fearfully save money for an elusive “retirement”, which is decades away, and which promises freedom and time to eventually do what we actually want. The mountain of things increases as we roll along, forcing us to move into larger homes, purchase more cars, consume even more and work even harder to maintain it all. Our brief annual respite of “vacation” tends to be a binge of urgently needed rest, often invaded upon by email and contact with “work”, as the office is usually only an annoying ping away. Retirement eventually comes, usually, though our bodies and spirits have been irrevocably compromised, leaving us incapable of fulfilling the longings for freedom and adventure that willed us along all those years. By then, though, so adept at setting aside our dreams for “reality”, we comfortably drift into aging, often fading away in “rest” homes away from the people we love, staring at a TV screen, distracted from the horror of our life and what we’ve given away to the powerful foes of acquiescence and fear. Make no mistake — there is a war on — for your mind, your energy, and your time. In order to win this war, you must engage in a process which will irrevocably pull you off of this path. This is what we call radical lifestyle redesign. We use the word “radical” because this path often looks very different from the vision portrayed above. But, from another vantage point, it is entirely natural, graceful and filled with abundance and joy. Radical lifestyle redesign starts with identifying your calling, or the theme which permeates your excitement in ways that can only be qualified as “divine”. This becomes your compass, a newly fashioned instrument for the modern day mariner seeking the ecstasy of a life rich with meaning and service. From this then a new vision begins to emerge, fueled by this newly tapped excitement. This energy begins to present us with powerful imagery of what our lives could become. We seek to follow this excitement in all sorts of magical ways. These gentle steps forward mark the tender beginning of a new, vibrant and powerful path. Each move in this new direction seems to fill us with a new and durable confidence, enabling us to take the next step, and the next, and the next. This second phase of the process is what we call “revisioning”. But, at some point on this path, you will have to announce this new you in a very powerful, dynamic and public way. This will feel exhilarating and, too, a bit scary. In some religious circles the official commencement of the spiritual path is accompanied with a ritual of “confirmation”, where you are acknowledged as a fellow traveler of the path in full view of others in the community. We feel this dynamic moment is best evoked via the story of Cortez presented above. To leave no way back you must, metaphorically speaking, burn the boats. You must powerfully and irrevocably step onto your new path, fully committed and often with no idea what lies around the next turn. It is only then that the universe’s mysteries become visible, where all manner of help and support appear. Why do most plans for change fail? Quite simply it is because this step is not taken. Without a burn the boats moment, it is far too easy to turn back. In order to succeed, therefore, crafting a personally meaningful, public and irrevocable moment is mandatory. Bob was a dear friend of mine, who worked 40+ years in a job he fully disliked, saving for retirement. Weeks before his retirement, he had open heart surgery. While under anesthesia, he had four small strokes, irreparably damaging his optic nerve. When he emerged from surgery, he was blind. His retirement was ushered in, then, with a complete inability to see the world around him. Bob’s story is uncommon in its drama, but very common in its drastic theme of disappointment and fear. Millions of people like Bob sacrifice today for tomorrow, day after day for decades, surrendering the prime years of their lives for an elusive “one day” down the road when they can follow their excitement and do what they actually wanted to all the time. But there are people pulling away from the tide of this river, forging their own streams, today more than ever before. To do so, they often take dramatic, irrevocable action. Because it often takes dramatic action to sever the pull of the mainstream, and they know they must make a change big enough that they can never go back. Tynan looked around and saw stuff. His home was filled with items he barely used, and he even had an entire room filled with things he had purchased from eBay and hadn’t even unpacked. One thing caught his eye — his beloved set of plates. He had spent a good amount of money for them, having scanned the internet for these exact ones. There they sat, in his kitchen cabinet, taking up space. He was a prisoner — of his home and his stuff. Many people feel this way, but Tynan did something dramatic about it. Knowing how easy it would be for him to stay stuck, he decided to burn the boats. He went onto Craigslist, and posted an ad — with his address listed — for people to come to his home the following morning and take it all away…free of charge. The opening time was 10am. That’s right. No charge, no reservation required, first-come first-served. At 10am the following day, he stood on his deck nervously looking towards the horizon, wondering if anyone would come. With lightning speed, things flew from his house. One man backed his truck up to the porch, throwing as much as he could possibly lay his hands on into the bed. Next, he bought a small backpack, and with a friend, traveled around the world for a year. When he returned, forever changed, he bought an RV and joyfully lived in it for 8 years, building businesses, traveling on a whim, living a life fully in line with his values and excitement. He now owns an island off the coast of Nova Scotia with ten of his friends, as remapping the grand human lifestyle experience seems to be his bag. All made possible because he burned the boats. Colin Beavan returned home from work one hot summer day in New York City and found his air-conditioning running. He stepped into his cool apartment, struck by how he had left the a/c on the entire day, keeping his home cool for his eventual return. At the time, he was writing textbooks, feeling marginally fulfilled in his life as a writer. Not the life he had imagined, but a good one nonetheless. But, this day was different. The US was at war in both Iraq and Afghanistan over the same energy he had needlessly used all day. Young men and women were dying so that he could run his a/c. The previous winter had brought unseasonably high temperatures to New York City, raising significant alarm as to the impact we humans were having on the environment. On the surface, this day was no different for Colin than any other. But, something in him stirred. “This isn’t right”, he thought. Not only was he expending energy in his empty home all day, but he was also returning from a job that was satisfying to a degree, but that he knew deep down, was not truly…”him”. Colin then made a decision — a full, maximum volume, commitment to actively examining his impact and looking to reduce it down to the barest minimum, hoping to eliminate it altogether. But, in order to truly burn the boats, to ensure he would go through with it, he publicly blogged about it, and… invited a film crew to track his and his family’s every move. This was not halfway, no. He put himself on public display, for a greater cause, and — like Tynan — found himself irrevocably changed. He is now a public speaker, an author of two highly successful non-fiction books, and coaches others on the art of finding meaning and purpose in their lives. It started because he made a decision — a big decision — to burn the boats, go all in, and radically redesign his life. Andrew and Gabriella Morrison had simply said “no” too many times. Their two beloved children wanted to do things with them, but due to the pressures of work and “responsibility”, the parents had to decline, again and again. There was a mortgage to pay, after all. The “American Dream” often boils down to buying one’s own home, and the Morrison’s had done exactly this. Only, when they looked around, they saw a house that was drastically underutilized, with 70% of it either filled with storage (of “stuff”), or filled with things or purposes that didn’t directly impact their lives. And, they were working damn hard to keep this all in place — for what? To say no to the people they loved the most — their kids? To offer their most precious resource — time — for work that wasn’t nearly as important as family? They sold 90% of what they owned, purchased a pop-up trailer, and drove down the Baja peninsula. There, they lived off-grid for 5 months, rediscovering their true values, and how they might consciously redesign their lives so that their lives matched what was actually important to them. After returning from their sojourn, they bought a small patch of land in Oregon and built their very own tiny house. Andrew had skills as a builder, and together they built the (now) famous “hOMe” for just over $22K — or $33K including all appliances and additions. At the begging of family and friends, they decided one day to shoot a quick video to show others how awesome this home truly was. Expecting about 20-30 views, the Morrisons posted it to YouTube and sent the link around. That was Feb 2014. Today, in the summer of 2017 — a mere 3 years later — this video has been viewed over 10 million times. The Morrisons now run their own tiny house business, selling plans and and the knowledge they have gained by living “tiny”. They run workshops around the world, and are leaders in the nationwide effort to rewrite city codes to make it easier for others to go tiny too. Radical lifestyle redesign, from one of numbing repetition and predictability to one of profound fulfillment, excitement and impact, usually requires a strong act of redirection. It can be dramatic, due to the powerful forces inherent in the mainstream path, and will usually feel rebellious and risky. Of course, this moment comes after you commit to a calling. Your calling is your gift, or life theme, which you’ve been uniquely designed and prepared to explore here on earth. (For more on understanding your calling, be sure to read part I of this series by clicking here). This calling then is your invitation to a new way of life. But, it is wholly incomplete and meaningless without a decision. And, no decision is real unless it flows into action. Your burn the boats moment is your decision made public, activated with the energy of your calling. It’s your primal scream of “no more”, when you’ve become willing to set foot into the wilderness of the unknown, fearing more the bland repetition and meaningless of before than the seeming downsides of tomorrow. You probably found this article because you feel partially — or wholly — unfulfilled. Yet each of us is born with a great promise, a possibility for creation and expression that is uniquely ours. When we are young, we dream of this special calling unfolding in an epic way. For those of us who wake up to the fact that the mainstream path doesn’t hold this promise for us… we are placed in a most challenging and exciting position. We are awake in lives that aren’t fulfilling. And, like a “splinter in the mind”, we can’t seem to let go of the fact that this needs to change. Let’s return to the story of Cortez, who washed up on the shores of his powerful enemy, with troops, swords and boats, ready for war. As his men dropped anchor and unloaded the supplies, with the enemy and his vast army watching, the general ordered his men to do the unthinkable. To the troops — and the enemy — this signals an unmatched confidence in the mission. An unwavering faith in the cause at hand. And, of course, the leader and his troops win the battle. The universe recognizes when we go all-in, and seemingly always has our back. The inability to turn back and retreat summons a remarkable faith and conviction in the hearts of the soldiers. Magic happens, therefore, when there is no true alternative but victory. Now, for most of us, imminent death is not lurking on our mainstream path, as in war. Is life meant to be lived with one’s head down for 50 years, a slave to a system that cares little for its subjects? A cog in a machine that brings little fulfillment? Revisiting this mainstream path for a moment: does that seem right to you? Do you think you incarnated into this beautiful, lush and abundant world only to stay in one place, repeat the same activities every day, eat food that makes you get sick, and die a lonely death in a home away from family and loved ones? A different kind of war, but a war nonetheless. This war, therefore, is playing out all around you, in every moment of every day. Awareness of your lack of fulfillment — to whatever degree you are aware of it — is your most precious gift. It is the road sign pointing towards a different life, towards an epic adventure of meaning and excitement. That road, or your own path, lies beyond a decision that must be irrevocable, that must be irreversible. That, like with Tynan, Colin, Andrew and Gabriella, must be dramatically made — and publicly too. For without our peers watching, without the social pressure from those we know and love, we are far less likely to see the task through. Without a full buy-in, with commitment and accountability, it is too easy to slip back onto the mainstream path, and back into the supposed comforts of mediocrity and… sleep. 1) The pain you feel fighting your dreams becomes greater than your fear of risk. For years, I had a day job that wasn’t at all satisfying. Sure, it paid well and I worked with good people, but it held very little meaning for me. It was a corporate job, in fact, where I had to dress a particular way each day, none of which ever felt like “me”. For 7 years, I put my head down and did the job. Every day brought enormous pressure, an endless array of fake conversations, and a to-do list that never ended which was driven by a “boss”. There wasn’t a day that passed that I didn’t think about leaving and never coming back. And then, one day, I finally did it. The pain I felt in not living my own life had grown so great that it overwhelmed my fear of risk. It would have been more painful at that tipping point to stay than it was to leave. In addition to the pain growing over time, I also took a number of actions along the way that would mitigate, or lessen the risk in leaving my job. While most people can’t see how to leave a job in which they feel miserable because they need money to pay their bills, virtually everyone has a variety of easy ways they could lower their risk for a dramatic life change. Often they cannot, or do not want to see them. In my case, I lowered my monthly expenses prior to quitting and started an online business as a dating coach. Within a few months in fact, I had a solid email list, two products for sale, and a coaching practice that was bringing in far more money per hour than my day job. Now, more than ever, the barrier to entry into entrepreneurship has never been lower, and sharing knowledge and information never more valuable. For me, even though I had never before been in business for myself, the dreariness of my day job motivated me to try something new. I found, as with most things, it was easier than I thought it would be. 2) You have some vision — even a vague and general one — for what might lie beyond this current paradigm. This often stems from a deep wish, a service you feel especially designed for. Your “calling”, as we refer to it, which excites you for what’s to come. For many, one’s calling comes through complete with images of freedom, more time to do what you want, or less stress and anxiety. Perhaps you envision more travel, or moving somewhere else. Perhaps you want a more meaningful work life, and a greater ability to contribute to the lives of others. Having a vision of your own business being very successful, bringing in more money than your current job working for someone else, while being able to work your own hours from wherever you want, is a very attractive image (and not at all uncommon). But, there needs to be something both pushing you (the pain of the present) and pulling you (your calling and it’s exciting imagery) for the change to happen — and to stick. If both of these are true for you, then you are ready to BTB. 3) You mitigate the feeling of risk so you will see it through. Sure, it’s scary. But, many of us have quite a few resources and options at our disposal that we might not be fully aware of, which can mitigate our risks. For example, if you’re considering starting your own coaching business (based on your calling, for example), what’s the big deal in living with a roommate or family member for a year or so while you get things rolling? Or, are you like me, and your prior employer socked money away for you in an IRA? There’s a penalty for pulling this out (10%), but — if you’re all in — saving for tomorrow is pointless, particularly if you want to take back ownership of your time and money by starting your own online business (something we highly recommend, btw). Are you holding on to all kinds of stuff, weighing you down, that you can sell? Any valuables that might bring in some cash to help tide you over? There is no greater feeling than whittling life down to the bare essentials, streamlined and flexible. Built for speed and efficiency, to make any move you really desire, at any moment you desire to. These actions are all about guarding against the downside, but what about now amplifying the upside? You could move from full-time employment into the freelance lifestyle, giving you more ownership over your hourly time. Or, you could fully leap into the world of entrepreneurship, building an audience online and packaging your skills into a coaching practice. These skills could even be written or recorded into a product which could be sold via your website. Selling information online is a billion dollar industry nowadays. We personally know many people who have taken their skills, packaged them into products and built 8-figure businesses. All of these being sold online, via web-pages designed on laptop computers, from anywhere in the world. This begins by putting up a simple website, growing your audience via any social media platform (Instagram or Twitter are the easiest), and offering your set of skills to others. You could even start by recruiting some friends to personally coach, giving you some valuable experience working with others and some testimonials to add to your site. One final comment on this, many people feel that they don’t have anything to offer in the form of information helpful to others. Most times, this simply is not true. We know people who have built million dollar businesses teaching others everything from gardening, to cooking, to dating, to massage, to carpentry…the list is endless. Right now, think of 3 things you are good at. Hypothetically, let’s say you are really good at changing tires. Go to Google or YouTube and do a search for “how to change a tire”. You will find multiple articles and how-to videos on the subject. Each of these individuals is, in some way, selling this – and other – information online. Entrepreneur Eben Pagan has started 8 7-figure online businesses selling dating and entrepreneurship advice. In fact, you can learn exactly how to take your skills and convert them into sellable products from Eben himself – right here. This free 3-part video series shows you the process he has used 8 times to take his interests and passions and convert them into products that sell. In other words, a little extra work now can pay off big later on. And, by the time you burn the boats, you can have another source of income already created or, at least being built, so that when you do make your move, you can focus on building up your more enjoyable – and more lucrative – income stream. 4) You design and execute an irrevocable move — and you make it public so you can’t turn back. You know what the past holds, and you also know what the future promises. But, what about…now? The BTB has to be irrevocable…which usually includes a public announcement of some sort. This is where you go from thinking about quitting your job (sometimes for many years) to announcing your resignation. Or, when you post your new website to Facebook announcing yourself as “open for business”. In order for the change to stick, there needs to be a public “moment” when you announce to your world that things are different now. Social pressure on the mainstream path often keeps us FROM taking action, but we can use it to our advantage too, by creating pressure in the other direction when we commit to taking dramatic action. And, it can happen soon. Even if you are 6 months away from leaving your job, you can give notice today. Often, it’s the giving notice part that is the scariest. By doing this, you then step into the reality of change, thus causing you to truly focus on building up that income stream and/or taking other actions so that when your last day comes, you’re ready for it. Your vision will shape the specific BTB moment. For Colin, a belief in serving the common good turned into a full-fledged, public experiment in becoming “No Impact Man”. For Tynan, the pursuit of freedom led him to give away all his things and travel the world. For Gabriella and Andrew, the value of getting closer to family led the Morrisons to irrevocably change their concept of home. What will your BTB be? Are you ready to burn the boats? The readiness should feel like excitement more than fear. It should feel exhilarating and freeing. In my view, your calling contains within it the promise of fulfillment. But, it won’t bear fruit without a complete, 100% commitment. Yes, there’s almost always some anxiety involved, but that’s how we always feel when we are growing. If you are truly ready, do something now. Right now. Maybe you don’t start with the full-blown BTB moment. But, assess your current situation and weigh the downside to change with a friend who might see things more objectively, and with less fear than you do. Do you have some resources you could rely on during a period of reduced income? Savings? Family? Friends? Do you have things you can sell? Are you particularly good at a certain skill? Is that skill something you can teach to others? Before you say no, go to google and type that skill into the search area. It’s a near guarantee that someone has found a way to monetize that. Become a coach; or become an affiliate marketer who doesn’t need to create his/her own product (and if you don’t know what that is, look it up! ); build a platform that amplifies others; or look into ways to reshape your work life so that you are a freelancer more in charge of your time and locale. You are going to commit to your calling and burn the boats. You are now committed to this more than anything else. The BTB act can only happen once this crucial decision has been made. In our experience, it amounts to nothing less than claiming your life as your own. Literally, everything can and will come from this. Those who don’t do this rarely move off the mainstream path. It’s allure, it’s pressures, it’s comfort – are all too appealing when resistance rises and real challenge surfaces along the new road. It’s just too easy to head back. But, if you know that there is no return path. 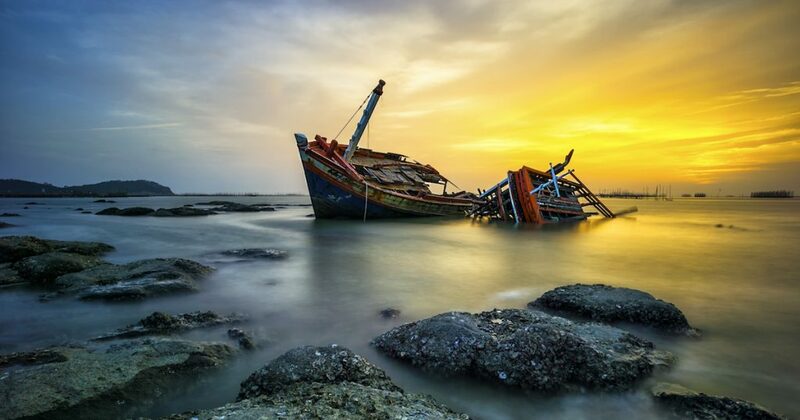 The boats lie in ashes on the shore, unusable, a symbol of your courage and a reminder of your commitment, you will press on and…you will succeed. Nothing short of this will work. Veering off the mainstream path is not for everyone. If it were, we would not have written this and you wouldn’t be reading it. Most people will follow the mainstream path outlined earlier in this article. A select few will choose something else. It’s a risk, yes, but when you weigh it against the inevitable outcomes of the well-worn path, what seems the greater risk? How you answer that will determine everything. So, what’s it going to be then? If you need a little help, we offer an exciting coaching program where we lead you through the process of determining your calling, revisioning your life, designing your “burn the boats” moment (or confirmation) and, then, fully redesigning your lifestyle (using the “7 Decisions” as a framework) so that it suits you, your calling, your excitement. I’ve been there and I know how challenging this can be. Our coaching program is where we help you unlock your calling and commit to this new, exciting journey. Then, we mitigate the apparent risk to making a change, build an exciting vision to pull you forward and design a powerful moment that will irrevocably change your life. With you, we will create an aggressive timeline for action, but one that also won’t tip you over into more stress than you can physically metabolize. In other words, we get you leaning into your comfort zone…without falling down. By inviting a coach into the process, you are far more likely to see it through than if you didn’t. The pressures against you are significant. This is certainly not impossible, but exiting the mainstream path and carving your own way is far more likely with an outside party engaged, guiding you and rooting you on. But…it is only for people who are ready. More adventure. More meaning. More life. If you are curious, we offer a free, 30-minute call just to give you a clear sense of how passionate we are about this work and guarantee that you will leave this call excited and determined, more than ever, to make this change – even if you choose not to work with us. Also, this call gives us ample time to see if you are truly ready for something like this. It is easy to get excited by the ideas and vision painted in this series of articles. It is something else entirely to be ready for a dramatic lifestyle transformation. 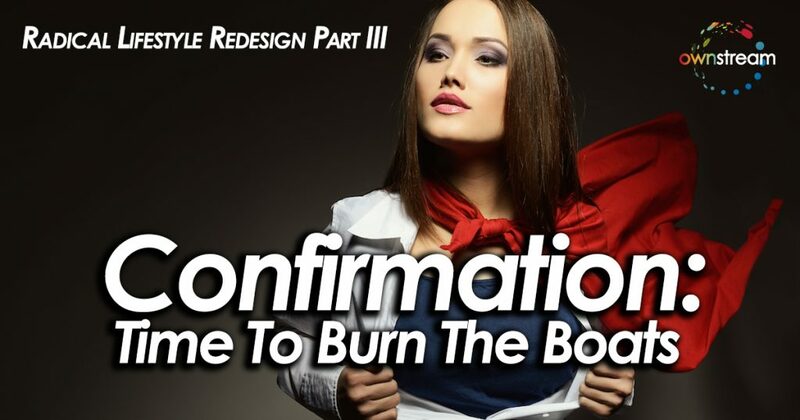 I guarantee that you will leave this call with enormous value and, perhaps, we will mutually agree that it makes sense to work together, co-creating your exciting lifestyle redesign and transformation. Even if we don’t actually work together, be sure to check out the weekly Ownstream Podcast where my wife Theresa and I interview the exciting mavericks who are redesigning their lives, forging new paths and showing others the way. We hope it will inspire you to move forward along your unique path, your “own stream”. Finally, if you haven’t already read it, check out our seminal “7 Decisions: Become the Ultimate Lifestyle Entrepreneur”. Here, we lay out the innumerable options at your fingertips across all of the major decisions facing us in this society. Often, we are led to believe that these decisions have a limited amount of choices available to us. Now, more than ever before, this is simply not the case. We wish you the absolute best, and hope to connect with you somewhere down the road! Part I: What Is Your Calling?